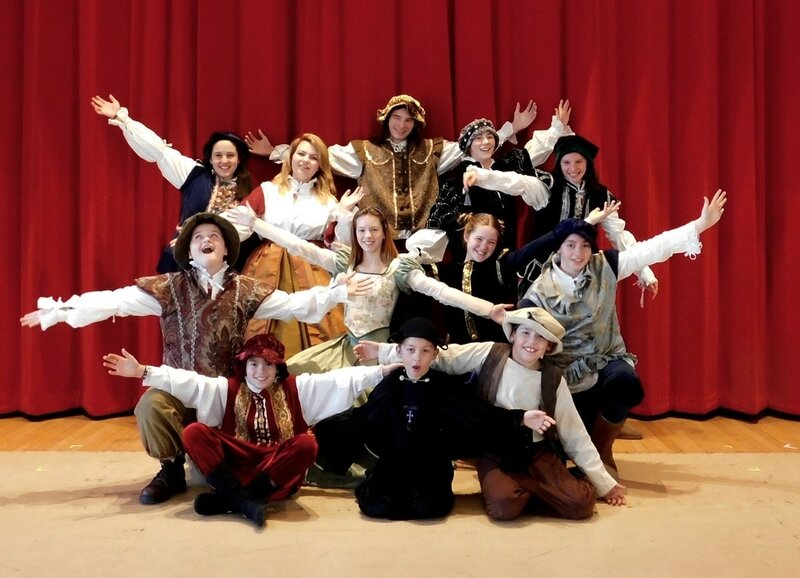 All the World’s a Stage Players is a nonprofit educational program offering young homeschool students an opportunity to learn about all things Shakespeare and perform in full-length productions of his plays. At AWSP, our students and families learn by ‘DOING SHAKESPEARE,' not by simply studying Shakespeare. We actively engage the whole person in all facets of our immersive educational model. We foster a true appreciation for Shakespeare that is unlike any other program. The students on stage range from ages 8 to 18, yet we incorporate the family in all aspects of learning, Young siblings grow into the program, while older students graduate from the program and return to help in the educational process. Many alumnus have even gone on to have careers in and around professional theatre. This year we have Alumni in residence who will have a large role in Assistant Directing and Stage Production. We meet weekly on Wednesdays, starting mid September with final performances at the end of March. ABOUT OUR DIRECTOR: This years director, Sharon Teague, is a seasoned homeschool mom of 6 children from preschool to college. She has expertise in many styles of learning from classical to unschooling. Wherever you are in your journey as a homeschool family, AWSP may just be what your looking for. We strive to educate and invite all ages and abilities into a multi-disciplinary approach which will engage learners in Language Arts, reading, memorization, linguistic studies, classic literature, literary analysis, European history, humanities and public speaking all through the amazing FUN of the theatre! Students and families will come away with new friends, mentors and a tremendous amount of growth as they work in all stages of production such as set design, costumes, lighting and sound in addition to ACTING. Please note: Parental support and involvement is essential to the group’s success. This is not a drop-off program, but flexibility is also a foundation of our success. Parents and/or guardians should be prepared to remain on the premises during rehearsals and performances, in order to fully participate in this program. We rely on our families’ support and talents to help make the program a success.